Colorado ski resorts offer some of the best skiing in the US. While the mountains are enormous, there really is something for everyone. If you're just a beginner, here are 5 resorts you must check out! Winter Park Resort is Colorado's longest continually operated ski resort. It is also the closest ski destination from the Denver Airport. With 3,081 acres of award-winning terrain, there is no way you can go wrong. Beginner slopes are spread across the mountain giving plenty of room to explore. While only 8% of their trails are green, the resort is so large that ends up being 39 beginner trails. The base area offers 3 magic carpet lifts for first-timers and beginners to develop their ski skills before hitting the slopes. Winter Park Ski & Ride School boasts the best lesson value for all skill levels. It is recommended you book at least 7-days in advance. Adult Max 5 Lesson - Perfect for beginners. Limited to 5 people. 3-hour lesson. Headway Easy Start Adult Lesson - First-timer lesson starting with short skis and progressing through 2 longer pair as you learn. Kids Group Lessons - Grouped by age and skill (ages 3 to 14). Half & Full Day. For the latest prices and to book online, check their website. Book at least 7-days in advance to receive up to 20% off your rentals. Also, with every 3-day pre-booked adult rental you will receive a free kids rental. It pays to reserve in advance. Click here to check prices and book online. The Coca Cola Tube Park is the newest in Colorado. They offer 4 lanes with banked curves and a conveyor lift to get you back to the top of the hill. In addition, you will find ice skating, ski bikes, and snowshoeing. Lodging is separate here, so your hotel may offer additional activities and amenities. Village atmosphere with spa services, and shopping. No crowds, no lines. Skiing here is the best. The slopes are well-groomed and there are plenty of wide and open runs. Telluride Ski Resort offers world renowned ski terrain. Don't let the size of the mountain scare you off. There's plenty for beginners. Telluride offers 34 beginner trails. That's only 23% of their terrain, which gives you an idea of how large the mountain is. With a total of 3 magic carpets, one is an adult magic carpet area designed for first-time skiers to practice before heading up the chairlift for more terrain. While a lot of Telluride's lessons are geared towards more advanced skiers, they do offer a few programs focused specifically for first-time skiers and beginners. To check rates and book online see their website. Telluride offers 7 slopeside ski rental shops for everything you need to hit the slopes. The process is fully automated to allow you to reserve online and skip the lines. Book online and check rates here. When you are done on the slopes, the Telluride Ski Resort area has plenty to offer for fun. Your lodging choice may even add to this list. The Spa at the Peaks - massage, body treatments, facials, multi-level fitness center, indoor swimming pool, meditation, a yoga studio, and much more. 12+ restaurant and bar venues from casual to fine dining. One of the best ski resorts in North America. There is terrain for everyone, from beginners to experts. The town of Telluride is also very nice. Buttermilk Mountain is located in Aspen. 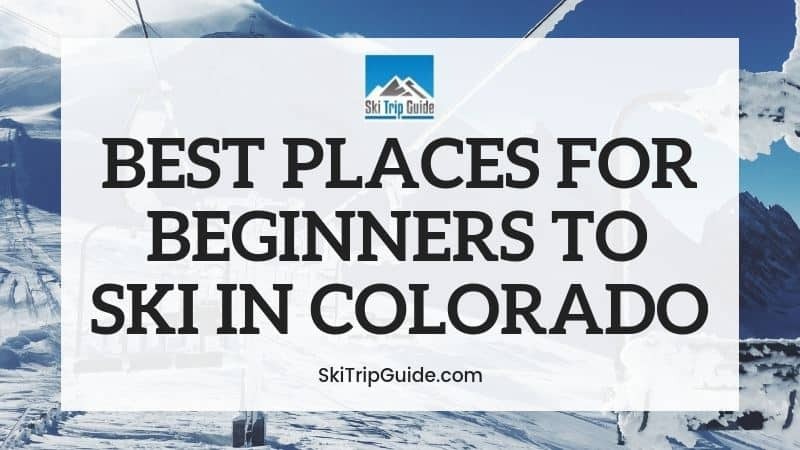 It is often considered the easiest mountain to ski in Aspen, which is why it's great for beginners to learn. They have also been the host to the ESPN Winter X Games multiple times. Worth considering for your first-time ski getaway. With 35% of their trails designated as easy, that provides 15 green trails for first-time skiers. Buttermilk offers 2 magic carpet lifts inside their learning zone near the base. Buttermilk claims their lessons take the intimidation out of learning to ski. Call to book your lesson in advance. Private Lessons - All ages. Half or full day options up to 5 people. Details and pricing can be found on their website. Reserve your rentals in advance and save up to 20%. Book for 4-days or more and earn a retail credit. Check current packages and pricing here. Buttermilk Mountain is part of Aspen Snowmass and they do offer snow tubing. Multiple lanes are open along with lifts to make the experience no work and all fun. Check out the newest attraction: the Breathtaker Alpine Coaster. Aspen has been recognized by Conde Naste as having the best apres ski scene in North America. There are 6 spots to grab drinks and party with friends. If you're not much for party scene, there is still plenty to offer. Plus, your hotel will fill in the gap with even more options. The mountain is so easy going and perfect for beginners and families. The uncrowded slopes are perfect for learning to ski. Beaver Creek offers 1,800 acres of beautiful terrain spread over 3 base lodge areas. It's so family friendly that every day at 3 PM they serve free, freshly baked cookie at the lodge. Plus, there is a candy shop at the top of the mountain. Take a chairlift to the top of the mountain for beginner trails with a view. Beaver Creek offers 16 green, easy trails. The majority of their beginner slopes are found at Bachelor Gulch. First-time skiers will find 1 magic carpet area designed to help them get comfortable on their skis before riding the chair lifts. Book your lessons at least 48 hours in advance, online. By doing so you can save on window pricing. Check the latest pricing and book online here. Multiple rental locations exist slopeside and within the resorts for your convenience. Save up to 20% of your rentals when you book in advance, online. Check the latest rates and packages here. There is no snow tube park in Beaver Creek. However, they do offer an ice skating rink. Dining: 4 restaurants on mountain, many more in the Village. Apres Ski Experiences: 4 venues with drink specials and food. Gourmet dinner cuisine: 4 cabin venues with a view. The Village offers more dining, shopping, and entertainment. Beaver Creek really caters to everyone with a great lift system, excellent terrain, fun apres ski scene and great food. Fewer crowds than other Colorado resorts. Breckenridge Ski Resort is the largest historic district in Colorado. It started as a gold-rush base camp and has become a real mountain town (not just a resort). With over 2,900 skiable acres spread over 5 peaks, it's no wonder people keep going back. Don't let the size of the mountain scare you. There are 20 beginner trails here to explore. Breckenridge offers 4 family-oriented learning areas. Inside, you will find 11 magic carpet lifts. Whether it's your first time out or you've only been a couple of times, Breckenridge has a ski lesson designed just for you. Check out their list of programs and pricing here. There are 7 slopeside ski rental locations. Or you can take advantage of their free ski delivery program and have them sent to your resort. Check out packages, rates, and book online. There is no snow tube park in Breckenridge. However, they do have an alpine coaster. Apres Ski Scene - Drink & appetizer specials at 4 venues. There is plenty of skiing for everyone at Breckenridge. Great variety of well-groomed green trails. Town offers plenty of shopping and things to do.